Come on down to Old Nick HQ – 50a Letitia Street, North Hobart – we’ll open the doors at 12PM on Sunday the 4th. The barbecue will be fired up, and we’ll have snags and vegetarian foods and soft drink and water, all the good stuff. Come along, have a chat, meet the production team and the other people auditioning and calm your nerves. You’ll fill out an audition sheet (name, number, allergies, etc) and book a time for your individual audition. After we’ve finished all the group activities we will go into the individual auditions. You will organise a time with one our lovely organised production manager before the group auditions begin. These will go for around five minutes each. Sing a solo song with our MD – it would be great if you could have at least 20 seconds worth of a song ready (a backing track prepped on your phone from YouTube would be amazing!). Rehearsals go all the way up to May 11th, when we open at the Theatre Royal. Our season lasts until the 26th of May in Hobart. Calls to the theatre are to arrive around 6PM to prepare and have a microphone fitted, and then 8PM the show starts. 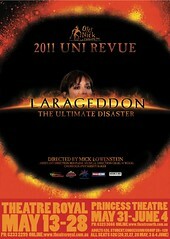 From May 30th – June 2nd, we are at the Princess Theatre in Launceston. In Launceston things are a little more relaxed. We provide accommodation and breakfasts. Unless you have to study your days can be spent lazing away and soaking up the northern atmosphere. On Wednesday 30th May you will either bus up with the cast or you may drive up yourself, but you will need to arrive by early afternoon so we can do a tech run of the show before opening that same night. That is a big day, so be prepared for it. If you need to sit exams, they can be arranged at the Launceston Uni campus so you don’t need to stress about being away from Hobart. Many Uni Revue cast and crew members have sat exams in Launceston, so we can assure you the Uni is accommodating and it is easy to organise.